In my quest for a clean and clear face, I realized that my make up routine would probably need to be adjusted. I want my skin to be as healthy as possible. So while we were braving hurricane Sandy, I had time to get a lot of those little things that you normally just let go, actually done. You know what I'm talking about-- cleaning out the fridge, re-arranging the closet, cleaning your makeup brushes. I thought that cleaning my make up brushes would be a big deal. Some time consuming thing. But I found out that it really wasn't. You literally mix up some water and vinegar, let them soak, and rinse them. Bada bing, bada boom. Done. I used a mixture of one cup of hot water and one tablespoon of white vinegar. 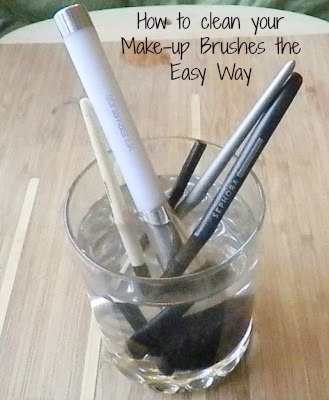 I let the brushes sit in there for about 15 minutes, and I swished them around a little bit to dislodge any makeup. It was actually pretty gross to see how much makeup these little babies had been holding. Thinking back, I should have gotten an after pic of the water. Once they were done soaking, I rinsed them first in hot, then in cold water. While I was rinsing them in the hot water, I rubbed each one just against my hand, so that any remaining makeup would come off. Once they were all clean, I just patted them dry on a nice little towel, and they finished air drying. They fluffed right back up with one use. Hopefully this will be just a tiny step in the right direction to keeping my skin healthy.